In 2012 the engine was updated to offer even greater performance, with significantly more refined torque between 2000rpm and 4000rpm. Changes to the PGM-FI fuel injection system, combined with increased tank capacity, meant the VFR1200F can now travel further on a single tank of petrol. The optional Dual Clutch Transmission was improved, with new functionalities. The adoption of a reassuring Traction Control System and along with a more comfortable seating position, further enhance the bike's all-round capabilities. For 2015 a new white colour scheme has been added. Launched in 2009, the VFR1200F was developed to deliver a blend of sports and touring capabilities using the latest technologies. It was a clean-sheet interpretation of the ultimate road-sport machine - a concept driven by extensive understanding of customer needs and the adoption of state-of-the-art technologies. In pursuit of heightened levels of control and feedback, the VFR1200F adopted the latest race-track bred technologies, adapted and evolved to create a machine that can be many things to many riders. The harmonic growl of the flexible and responsive V4 motor rekindles the emotions inspired by previous iconic VFRs, with its unique 'heartbeat' engine feel and an unrivalled level of refined performance. The VFR1200F engine was designed to provide its rider with high speed, quick acceleration and a strong, engaging feeling coming from the engine's power characteristics. Honda also wanted to deliver the invigorating engine sound and feel that characterise V4 sports bikes, but with an additional focus on comfortable, responsive power delivery. The new V4 engine's performance is delivered where it's most useful and most enjoyable. Its linear torque curve is focused in the low and mid range, making it possible for the rider to simply roll on and off the throttle while powering through bends. Honda MotoGP V4 engine technology and architecture bring cutting-edge performance to the VFR1200F. Light and compact, the 1237cc liquid-cooled engine pumps out amazing levels of power with a distinctive V4 feel and sound. Unique cylinder layout with rear two cylinders located innermost on the crankshaft and front cylinders located outboard narrows the rider interface aboard the VFR1200F. A throttle-by-wire system improves the rider's connectivity with the VFR1200F. Providing light, precise fuel metering at all engine parameters this highly developed accuracy gives the rider increased levels of control, whatever the situation. Peerless handling and stability The VFR1200F frame, suspension and drive components are brought together in a unique configuration that facilitates both sports bike power and smooth stability. Its strong aluminium twin-spar diamond configuration frame is both lightweight and rigid. The swingarm and driveshaft length are optimised without extending the overall length of the motorcycle. The long swingarm contributes to balanced, confident manoeuvring and exceptional high-speed stability. The swingarm is complemented by a compliant Pro-Link rear shock absorber with adjustable rebound damping. At the front, sturdy upside-down 43mm telescopic forks with adjustable preload provide smooth and assured control. Together, these systems ensure a comfortable ride, even with a pillion and luggage on board, and add to the overall feeling of total control. 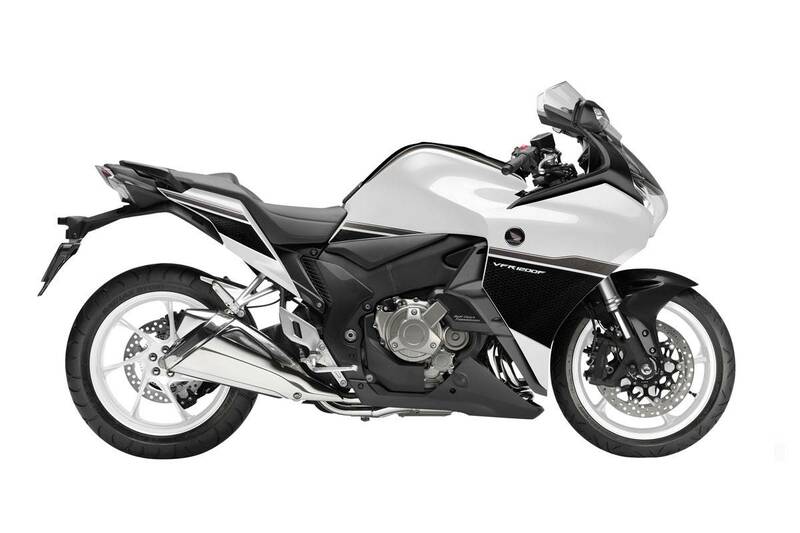 High-performance braking systems The VFR1200F is equipped with Honda's highly-developed Combined Antilock Braking System. Powerful six-piston calipers for the front and two piston calipers for the rear act on large discs (320mm at the front and 276mm at the rear). The Combined Braking System creates the optimal balance of front and rear braking forces. The addition of a standard-fit compact and lightweight Anti-lock Braking System supports both the motorcycle's sports riding potential and its touring proficiency. NEW Comfortable dual-seat. In 2012 the seat of the VFR1200F - a supportive, vacuum-moulded dual-seat design - was re-designed to offer improved seat grip with new stitching and improved quality with a new seat coating finis. It features a flat and expansive seating area, with the space to adopt a range of different seating positions. This improves comfort during long days on the road. For the pillion, easy-reach grab handles and footrests ideally positioned for comfort, help create a reassuring sense of security. Instrument panel. The VFR1200F instrument panel combines sophisticated styling and practicality. Shielded and at the same time displayed by the tilt of the aerodynamic windscreen, its elegant design fully complements the airy and spacious feel at the front. It also adds to the sensation of total rider control. A large, sporty analogue rev counter and a digital speedometer are surrounded by LCD readouts which now include actual, average fuel consumption as well as remaining and range of fuel and Traction Control System activation (On/Off). The display also includes a clock, ambient temperature display, HISS indicator and ABS indicator. Pannier mounts to enhance the touring potential of the VFR1200F, the rear is equipped with integrated luggage mounts. These mounting points are unobtrusively cast into the injection moulded under-seat area and pillion footrest mounts. They allow easy installation and removal of specially designed optional panniers without interrupting the motorcycle's clean styling. Ergonomic hand controls The VFR1200F features a state-of-the-art ergonomic design of the handlebar and switch layout. The designers focussed on meeting the rider's need to reach controls comfortably and for ease of operation, particularly considering the hand position during cornering. As a result, the VFR1200F received new handlebar switches and a new layout with reversed horn and indicator controls. The indicator switch shape is designed around natural thumb movement for effortless operation.